Mandeville is the capital of Jamaica's Manchester parish. In 2005 the town had an estimated population of 50,000, and including the immediate suburbs within a radius of 16 km (10 miles) the total population is about 72,000. It is located on an inland plateau at an altitude of 628 m (2061 feet), and is 103 km (64 miles) west of Kingston. 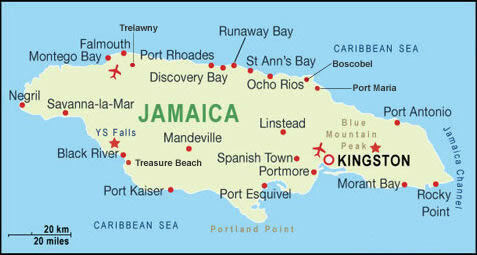 It is the only parish capital of Jamaica not located on the coast or on a major river. Mandeville lies on a plateau more than 2,000 feet (600m) above the sea in the tropical central highlands of Don Figuerero Mountains. It is little known as a tourist destination but for visitors who have stayed the rolling hills and serenity is most memorable for individuals seeking relax surroundings. Much cooler than the coastal resorts, it's a possible base from which to explore the South Coast. The town was laid out in 1816 and named after Viscount Mandeville, the eldest son of the Duke of Manchester who was then governor of Jamaica. Many of the original buildings can still be seen such as the courthouse, an impressive building of cut limestone with a horseshoe staircase and a raised portico supported by Doric columns and built in 1820. The oldest dwelling is the rectory beside the courthouse, also built in 1820. Many of Jamaica's businesses were started in Mandeville; the Mandeville Hotel, one of the oldest in the Caribbean, began operations in 1875. Its golf club, founded as the Manchester Golf Club in 1868, was the first golf course in the Caribbean. It has the first &qout;Free Library&qout; in Jamaica was established in 1938, and is the oldest Parish Library. Mandeville, principal town of the parish of Manchester, is a quiet, restful mountain resort, a little over 2,000 feet above sea level with a cool climate (70-75 degrees by day, 65-70 degrees by night) ideal for such pursuits as golf, walking and horseback riding. It is a land of warm and welcoming people, inspiring scenery and so many unique and engaging ways to experience it; you'll want to come back again and again. Some of the main attractions within easy access of Mandeville are the Cecil Charlton Park, The Rectory, Bloomfield Great House, Huntington Summit, Marshall's Pen, Roxborough, Appleton Estate Tours, Apple Valley Farm Tour, Bamboo Avenue, Lover's Leap, Mayfield Ranch, Milk River Bath, Salt Pond, South Coast Safari, St. Elizabeth Safaris, Treasure Beach and Y.S. Falls.